Cherry-co was the title of a tune by Don Cherry which first appeared on the 1966 album The Avant Garde, a revolutionary piece of work jointly authored by Cherry and John Coltrane. The title, was in part a punning reference to the jazz standard Cherokee, in part a conflation of Cherry and Co(ltrane). With a strong musical sensibility, both melodic and rhythmic, the trio plunges deep into the progressive universe of these composers, taking the opportunity to innovate as well while re-shaping the tunes with a tweak of their own. With a full-bodied acoustic sound and an infallible understanding of one another’s movements, the band begins this journey to the past with the reggae-ish Roland Alphonso by Cherry, who composed it for the Jamaican tenorist referred to in the title. 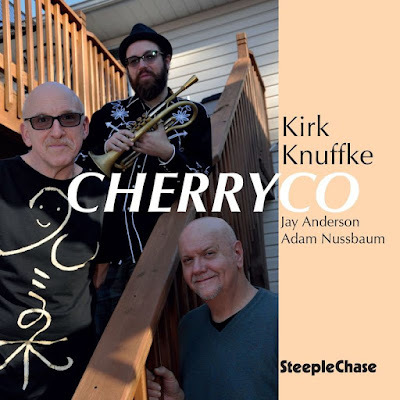 After blowing the theme’s deep-seated melody with crisp delicacy, Knuffke embarks on a trippy improvisation that will keep you engaged and enthralled, at the same time that stimulates his peers to push forward. After Anderson’s loping bass solo and the reinstatement of the theme, the final vamp briefly allows Nussbaum to intensify his unostentatious brushed attacks. Coleman’s shape-shifting The Sphinx is obstinate and animated in equal measure. The drummer's percussive intro has the feel of a march throughout, preparing the ground for the brisk melody that erupts from Knuffke’s cornet. Well accompanied by Anderson’s playful game, he engages in a funk rock backbeat when the time to improvise arrives, but just until they decide to make another adjustment toward a hasty swinging flow. When Knuffke regains the spotlight again, Nussbaum throws in lots of cymbal and snare drum whisks. In the same vivid spirit, Cherry’s Paris Ambulance Song stands out through gracious coordination. By the end, we have Knuffke and Anderson trading fours with the drummer - which they also do on Coleman’s Jayne, but this time expanding it into eight bars. This last tune, delivered with strong Latin accents, swings aplomb, propelled by a rhythm section that moves constantly in the pocket. Mood variations are constant throughout the recording. If Art Deco feels like a gentle jazz standard and grooves along with sweet-sounding solos, Remembrance, a blues-based piece packed with Latin touches, funk, and swing, gains a stimulating African pulse whenever Nussbaum operates with mallets. In contrast, Golden Heart displays bouncing unisons uttered by cornet and bass on top of a fluid rhythm, carrying an inherent Arabic feel attached.